Local stamps were produced during 1945 for the Soviet occupation zone town of Meissen (Meißen in High German) in Saxony. The town is situated on the Elbe River near Dresden. Meissen dates to the early 10th Century. The Gothic Albrechtsburg Castle and Meissen Cathedral are located on a hill overlooking the Elbe River. 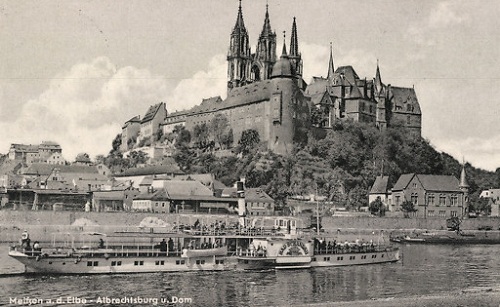 The castle and Cathedral are featured in the postcard image above. The castle was the official residence of the royal House of Wettin. Princes of the House of Wettin have, at various times, ascended the thrones of Great Britain, Portugal, Poland, Saxony, and Belgium. Prince Albert of Saxe-Coburg Gotha, who married Queen Victoria, was a member of the House of Wettin, with Victoria herself, actually being a member of the House of Hannover. Of course, Meissen is World famous for its porcelain, created from the extensive deposits of China clay and potters clay in the area. Meissen porcelain was the first high-quality porcelain to be produced outside of East Asia. The first European porcelain was manufactured in Meissen in 1710, when the Royal Porcelain Factory was opened at the Albrechtsburg Castle. In 1861, the factory was moved to a nearby valley, where it still operates today. Classic Meissen porcelain products are considered among the World's greatest works of ceramic art, and today, these beautiful items grace many art collections and art galleries around the World. In June 1945, the 1 Pf. - 1 Mk. denominations of the 1941-1944 Third Reich Adolph Hitler definitive stamps series were handstamped in violet, for use as local stamps in the Meissen Area. 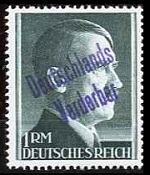 The handstamp read "Deutschlands / Verderber" or "Destroyer of Germany", an obvious message relating to the personality pictured on the stamps. An example is shown in the first image above. The 6 Pf. denomination exists with this handstamp in orange red, and it is very rare. Individually, these local stamps are rather common, but due to their nature, the purchase of authenticated examples is strongly recommended. This handstamp also exists on the 2 Mk. - 5 Mk. denominations and on other Third Reich stamp issues, but they are very scarce. Refer to the Michel Deutschland Special Katalog volume 2 for details. Later in June, a machined version of the overprint, in red and in yellow, was used on the 5 Pf. and 6 Pf. Adolph Hitler denominations. These are exceedingly rare. The machined overprint, in black, was also applied to the 5 Pf., 6 Pf., 8 Pf., and 12 Pf. denominations. These stamps are common. They are shown in the second image above. This issue is also known with double overprints, shifted overprints, and in pairs with missing overprints. The four local stamps shown above were issued on December 31, 1945, to raise money for local reconstruction projects. The stamps were issued perforated 10 3/4, perforated 11 3/4, and imperforate. The imperforates are expensive. A souvenir sheet, featuring these designs, was issued in January 1946. The stamps in the souvenir sheet are rouletted.